NOTES: Basically the old Frog kit. Built to a specification for a low wing monoplane fighter, the Fokker D.21 first flew in 1936. Even though the specs required an all-metal aircraft with retractable landing gear, Fokker's factory was not set up for such an endeavor so was built in Fokker's traditional method; fabric over tube frame with fixed landing gear and wooden wings. The aircraft was really designed for the Dutch East Indies, where ruggedness was more important than being technologically advanced. 36 aircraft were eventually ordered and powered by British Bristol Mercury engines. The Finns liked the aircraft and ordered 7 along with a manufacturing license, where an additional 93 were built. 10 were built by the Danes. The final aircraft for the Dutch were delivered just on the eve of WWII. During the invasion of the Netherlands, there were 28 operational aircraft and though out classed by the German 109s, they gave a credible defense. The Finns did much better with their D.XXIs against the Russians and many survived the war with the last being retired from service in 1948. Those of us who have been around for a while will remember Frog. 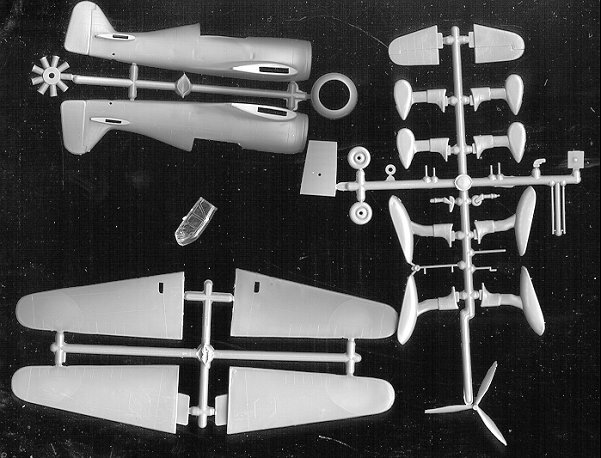 They produced interesting, easy to build models. Many of the subjects Frog did were not eclipsed until just recently and there are still some subjects that have not yet been duplicated by upgrades. This kit looks very much like Frog's version. It is a pretty simple model with raised panel line detailing, a one-piece canopy and a very basic cockpit. Even the markings and options are similar. Since it is a fixed gear plane, no wheel well detail is needed. The cockpit consists of a floor and seat. Lots of room for detailing if you so desire. The only option is for skis in place of the wheeled landing gear. Instructions are five construction steps. No color info in provided during construction or for the overall scheme. I guess we are supposed to know how to paint this one! Markings are given for two planes. One is a Dutch aircraft in their colors of tan, dark brown and green with the orange triangle insignia. The other is a Finnish version on skis in dark green and black over light blue with yellow Eastern Front markings. Decals are not bad and go on the model well. I've built this kit and can tell you that it is a pretty easy build. Just the thing if you want something relaxing or if you are a new modeler who doesn't want to hassle with a lot of fiddly bits. Preview kit courtesy of your editor.